Jack is 10-years-old and has cerebral palsy. 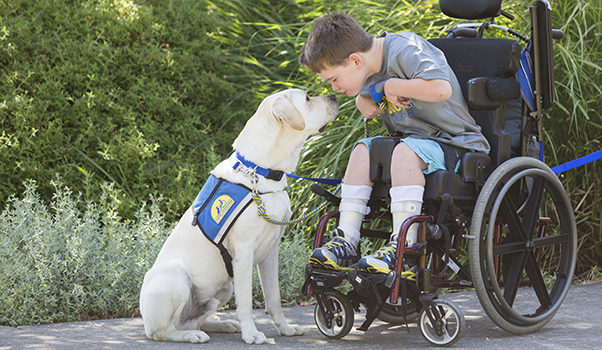 Last summer, Jack was matched with Canine Companions® assistance dog Drake, and his life has been deeply impacted. Jack’s mom Jana explains, "Since receiving Drake, Jack has become more self-confident, shown more responsibility and connected with his peers more than ever before." Drake enhances Jack’s independence by picking up and delivering dropped items, opening and closing doors and drawers, and by serving as a social bridge to Jack’s peers. Jack says, "When Drake visits me at school, all the kids ask me if they can pet him, which I like, because it helps them want to get to know me, too." Click here to learn how Jack uses Drake in therapy sessions and how you can help give a dog a job. Shawn knows the impact that an assistance dog can provide to assist with his Muscular Dystrophy. Read how he is now partnered with Service Dog Melissa, marking Canine Companions’ 6,000th graduate team. Everyone over 70.5 years must take a mandatory IRA distribution which could add to taxable income. You can make a gift directly from your IRA account to help support Canine Companions. Learn more. Cathy Fischer started volunteering more than 14 years ago, and her influence has impacted almost every facet of Canine Companions. Read more about her generosity and this year's Jack Warnock award. The gift shop is back! Send an eCard this holiday. The holidays and your assistance dog. There's still time to order your 2019 Canine Companions Puppy Calendar and holiday cards! You can have the cutest and fluffiest New Year's resolution!